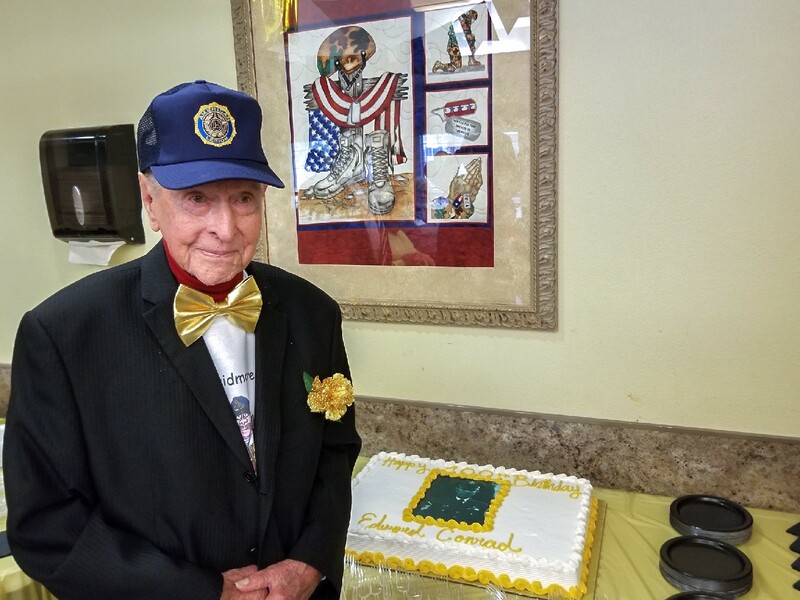 Doyle Taylor, a U.S. Navy Veteran and resident of the Clyde W. Cosper Texas State Veterans Home in Bonham, Texas, celebrated his 100th birthday on Friday, November 16, 2018. 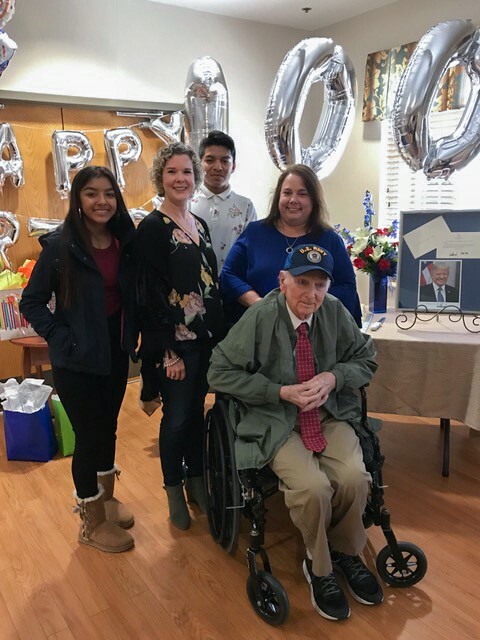 The Veterans home hosted a private reception for Mr. Taylor where he was joined by his grandchildren and great-grandchildren, and other distinguished members of the community. 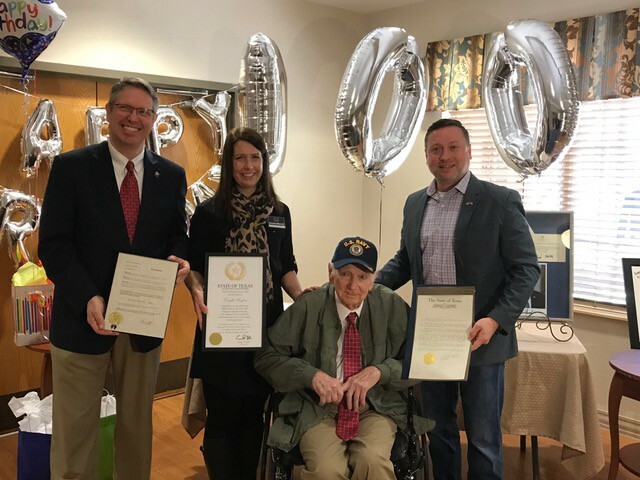 Amanda Gilbreath, VLB On-Site Representative for the Veterans home, presented Mr. Taylor with a certificate from George P. Bush, Texas Land Commissioner and Chairman of the Texas Veterans Land Board (VLB). 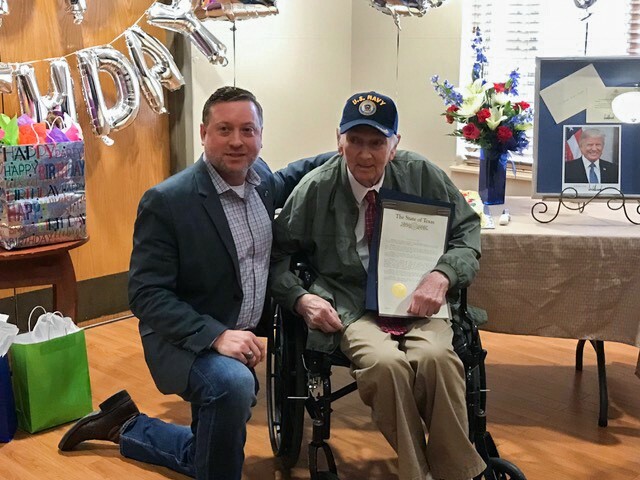 John Vick, District Director for Texas Senate District 2, presented Mr. Taylor with a resolution and flag from Texas State Senator Bob Hall, and John Trubey, a Bonham city council member, read a proclamation declaring that November 16th was officially Doyle Taylor Day. Mr. Taylor was born on November 16, 1918, in North Zulch, Texas. He grew up on a 300-acre farm with his parents and four younger sisters. As a young man, he went to work at the North American Aircraft Corporation in Dallas. 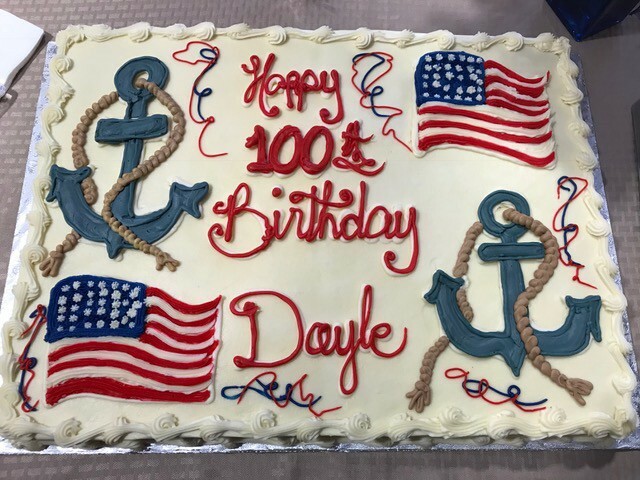 On September 22, 1942, at the age of 23, Doyle Taylor enlisted in the U.S. Navy and served at the Naval Air Station Alameda in northern California. After three years of service, he was honorably discharged as an Aviation Metalsmith 3rd Class on his 27th birthday. 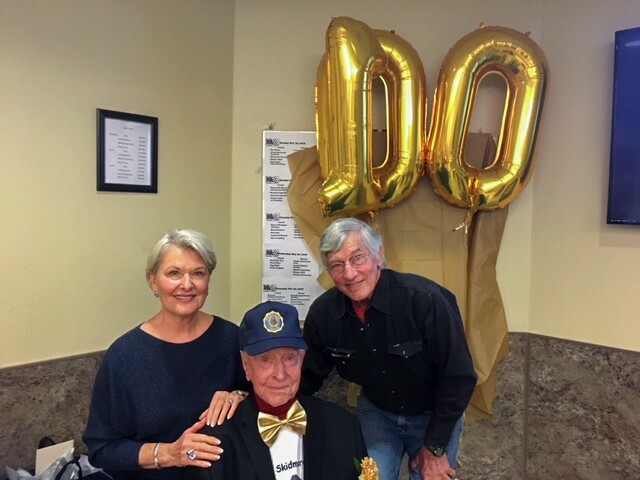 After leaving the Navy, Mr. Taylor took his wife, Celia, and their only child, Larry Taylor, to Grand Prairie, Texas, where he worked as a mechanic at Steakley Chevrolet until his retirement. He and his family then moved to Gilmer, Texas where they enjoyed fishing, gardening and raising cattle. 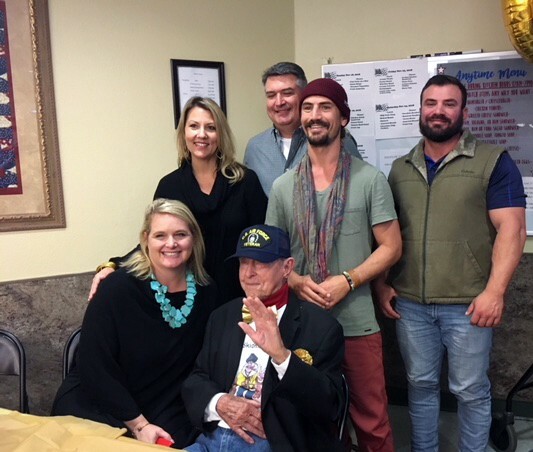 Mr. Taylor has been a resident of the Clyde W. Cosper Texas State Veterans Home since February 2016. Many thanks to KXII News 12 for their coverage of this very special event! 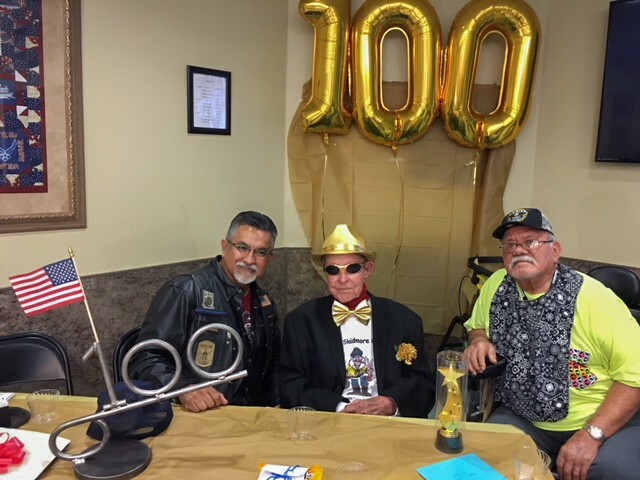 On Monday, November 19, 2018, the Frank M. Tejeda Texas State Veterans Home hosted a party to honor Edward Conrad, resident and United States Air Force Veteran, on his 100th birthday. 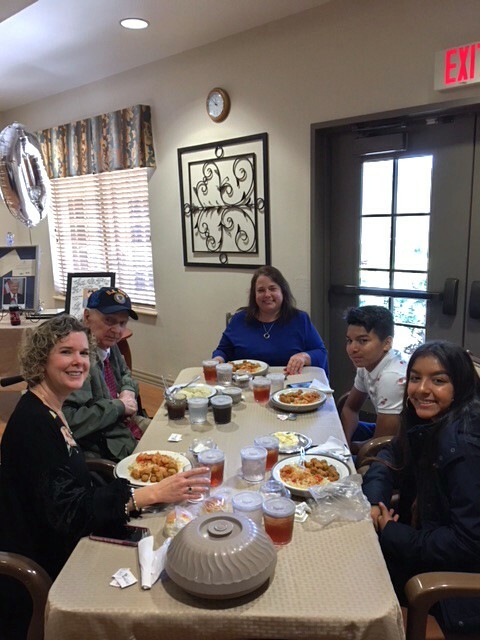 The Veterans home invited family, fellow residents, and distinguished guests to help Mr. Conrad celebrate this greatest of milestones. Edward Conrad was born on November 19, 1918, in Ponca City, Oklahoma. 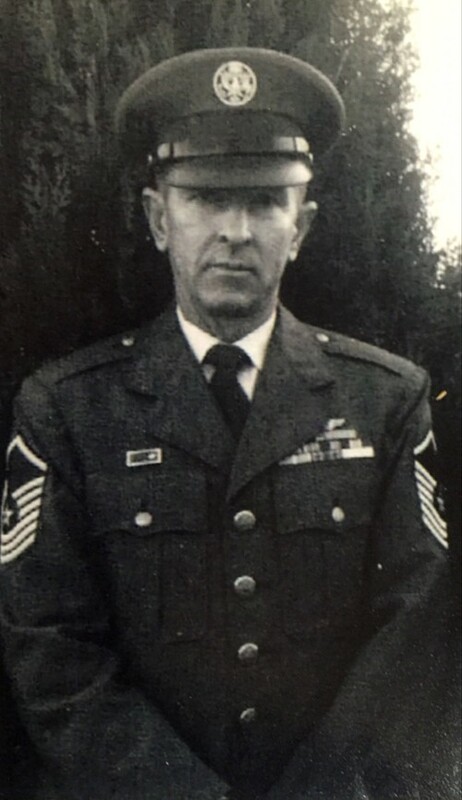 He enlisted in the U.S. Air Force and within six years became a Master Sergeant. Conrad served as a Maintenance Chief during World War II, the Korean War and the Vietnam War. Listen to Edward Conrad tell the story of his military service for the VLB Voices of Veterans Oral History Program. After leaving military service, Conrad worked as a rancher in Possum Kingdom and Skidmore, Texas. He enjoys spending time with his children, grandchildren and great-grandchildren and is an avid fisherman and hunter, who likes traveling in his R.V. 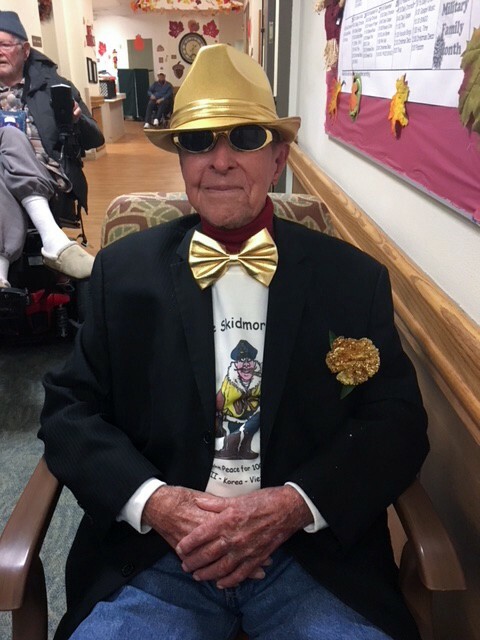 Mr. Conrad entered the reception to the song “Hey, Good Lookin” by his favorite singer, Hank Williams, and there were a lot of cheers and applause as he showed off by circling the entire dining room. 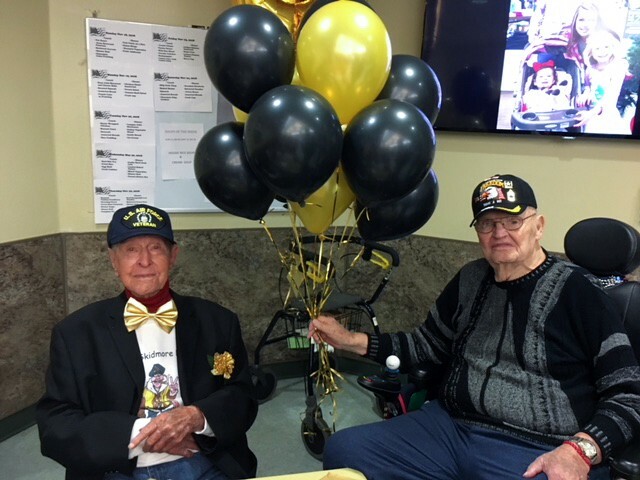 He was not only praised for defying the odds — male children born in 1918 have only .5% chance to reach the age of 100 — but also for serving in three wars: World War II, Korea and Vietnam. 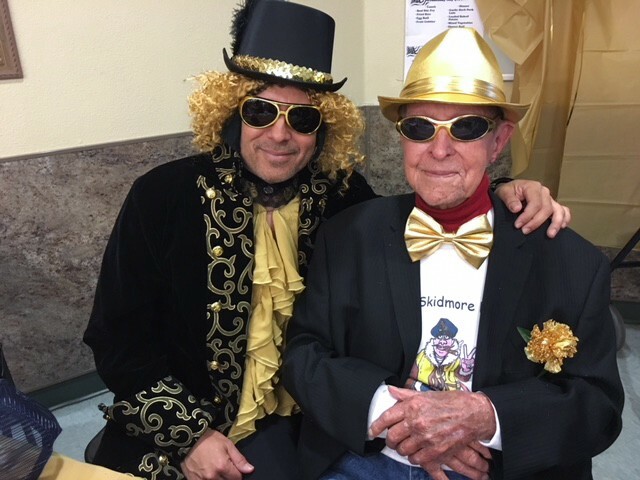 His children, grandchildren and great-grandchildren traveled from near and far to honor and celebrate a life well lived. 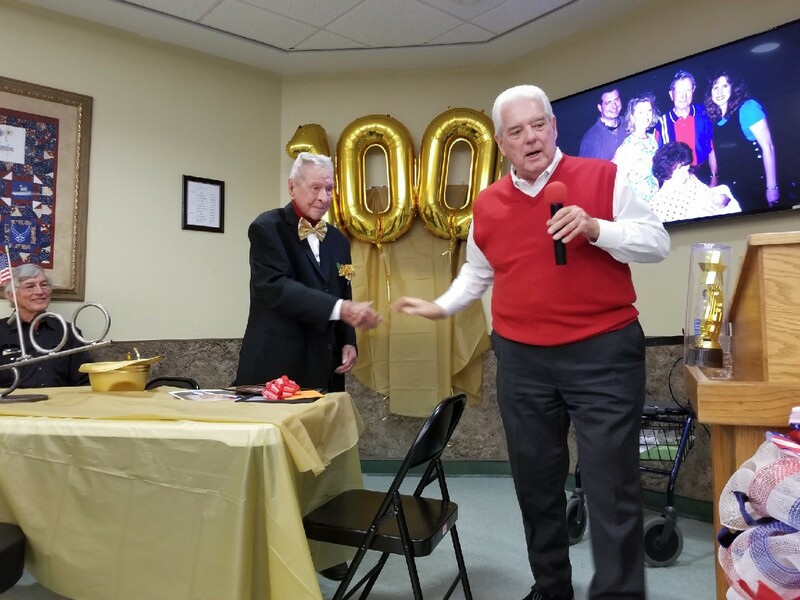 They prepared a slide show, which was enjoyed by everyone in attendance and his son welded a metal “100” sculpture to commemorate the occasion. 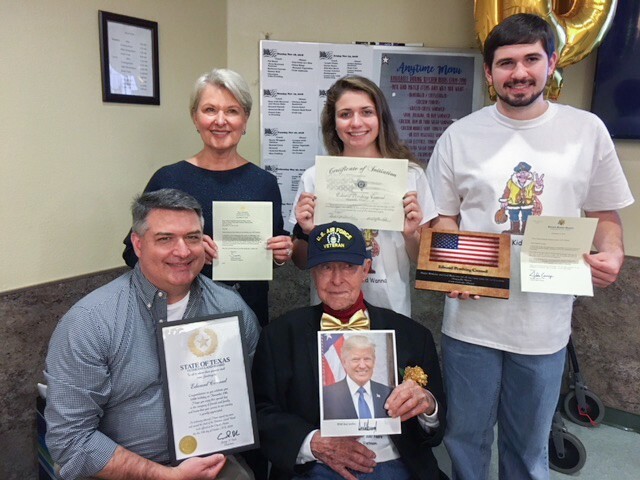 He received a picture and letter from the president as well as a framed certificate from George P. Bush, Texas Land Commissioner and Chairman of the Texas Veterans Land Board. He was given a letter by U.S. Senator, John Cornyn, and U.S. Representative, Sam Johnson. 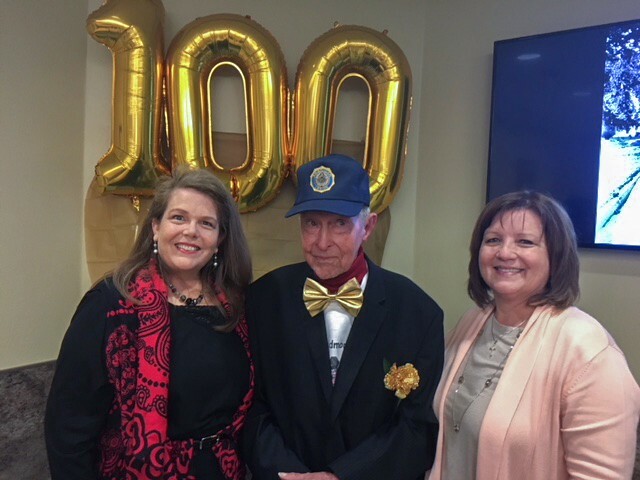 The Floresville City Council recognized Mr. Conrad for his service to our country and Floresville Mayor Cecelia Gonzalez-Dippel presented him with a plaque commemorating his centennial. American Legion Post 38 presented him with a pin and a certificate making him an honorary member. Music, refreshments, and a good time were had by all. We love Mr. Conrad and are blessed and honored to be a part of his life! !